WRITTEN BY DAVID A TURPIN, JR.
Ms. Terry Burke has ruffled some feathers at the United National Antiwar Coalition. The veteran antiwar and international solidarity activist has written an outstanding criticism of UNAC’s hypocritical silence in regards Assad’s war crimes. Her critique is a welcome breath of fresh air in a moribund antiwar movement. US antiwar opposition is in a profound crisis, and the crisis is a direct result of the hypocrisy of UNAC’s line on Syria. The facts about the Assad regime’s murderous policies can no longer be denied, and UNAC’s leadership is engaging in damage control, abruptly changing tactics from arrogantly ignoring critical voices, to pedantry and warning against following Ms. Burke’s example as this will “weaken and divide” the antiwar coalition. Indeed. Lecturing Ms. Burke about US imperialism and ominous warnings about divisions, however, will not make the crisis go away. UNAC’s leadership needs to assume responsibility for the crisis of our movement: their cover ups of Assad’s chemical attacks, their denials, and their apologies for the regime’s campaign of terror from the skies have completely undermined UNAC’s moral authority. The United National Antiwar Coalition’s refusal to condemn the Assad regime’s war crimes actually facilitates the ongoing, expanding, militarist, terrorist and misnamed US-led “War on Terror”. The moral basis for opposition to the “War on Terror” rests on condemnation of the use of modern weapons of war in indiscriminate violence against civilians, but UNAC’s leaders have betrayed principle and corrupted the purpose of building an antiwar opposition by becoming apologists for the bloodiest agents of terror in Syria: Assad, and his backers in Russia and Iran. Assad cannot govern Syria; his regime relies on a policy of collective punishment through sieges and the indiscriminate use of air power against civilian populations in areas liberated from regime control. Assad and his supporters’ crimes against humanity are widely documented by Amnesty International, Human Rights Watch and Doctors Without Borders. Denying overwhelming evidence, UNAC publicly laments the “demonization” of Assad, all the while demonizing the democratic opposition as “Islamic extremists” and “foreign financed terrorists”. By repeating the Assad regime’s lies, the leadership has converted the antiwar coalition into an “antiwar” propaganda machine for a war criminal. This is why UNAC is unable to offer a serious challenge to the US “War on Terror”. The leaders of UNAC cheerlead for Assad as he murders and maims indiscriminately, in the name of fighting “terrorism”; what then are their objections to US airstrikes? 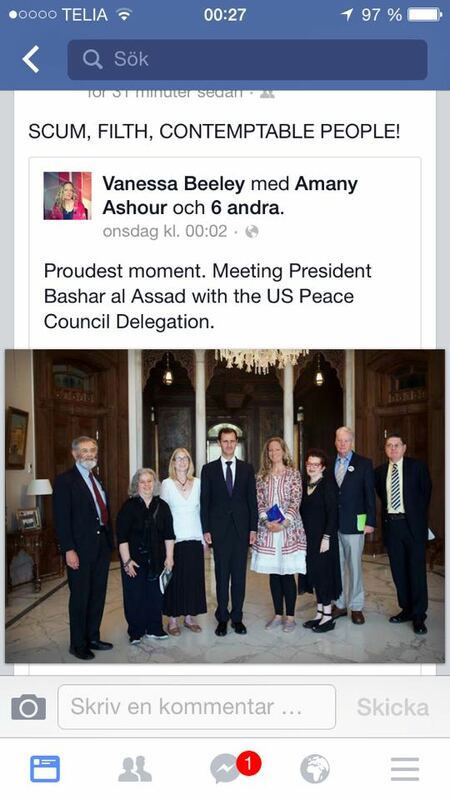 UNAC’s leadership seems oblivious to how well Assad has played them. Assad has proven himself to be an excellent, if cynical, student of US propaganda. The dictator has purposefully crafted his image to present his regime as potentially the most reliable ally of the US Coalition’s “War on Terror”. UNAC’s slavish repetition of Assad’s line leaves the “antiwar” coalition unable to mount serious opposition to the ongoing expansion of the direct US military intervention in Syria, which contrary to UNAC’s claims is not aimed at regime change, but specifically at targeting Daesh. US jets already share Syrian air space with Assad’s and Russia’s air force, so the accommodation of the US, and Assad and Russia, is a consummated and objective fact. Whatever lip service the Obama administration payed to democracy and human rights in Syria has long been forgotten; anymore, Obama doesn’t even bother to mumble. Moreover, Kerry and Lavrov are working hard for an agreement on formal collaboration between Russia and the US. In all likelihood, this agreement will leave the Assad regime in place, ostensibly during a “transition period”. Once the goal of regime change has been taken off the table, and the US has never seriously pursued this goal, how will UNAC oppose the “War on Terror”? Will UNAC demand Assad be made a full partner in the US-led Coalition, because he can use his barrel bombs and poison gas without political repercussions? Do the leaders of UNAC, who loudly boast of their experience and knowledge of history, recall that papa Assad joined Bush’s US coalition in an earlier episode of the never-ending “War on Terror”? Madelyn Hoffman being briefed before the “spontaneous” objective conference for the press! UNAC’s leadership has been played for fools by the Assad regime. They’ve also foolishly fallen for US imperialism’s feigned support for the opposition. It is obvious from UNAC’s statements that the leadership sees the US playing homologous strategies in Afghanistan in the 80s and Syria today, but the trickle of small arms once supplied to the Syrian opposition, and always with strings attached, contrasts sharply to the flood of weaponry the US channeled through Pakistan to the Mujahideen, weapons which included ground to air missiles. In Syria, the US has imposed an embargo specifically preventing the opposition from acquiring air defense systems, and the US attempts to control the supply of heavy weapons, precisely because it wants to control the struggle against Assad. If regime change were the real objective of US imperialism, why does it dither? The pitiable US antiwar movement has certainly not been a factor even worthy of consideration. UNAC’s tiresome and repetitious lectures about the savage history of US imperialism miss the point: in Syria the US is just as opposed to democracy as it is anywhere else, but in Syria it leaves the dirty work of butchering people to the Assad regime, Russia and Iran. 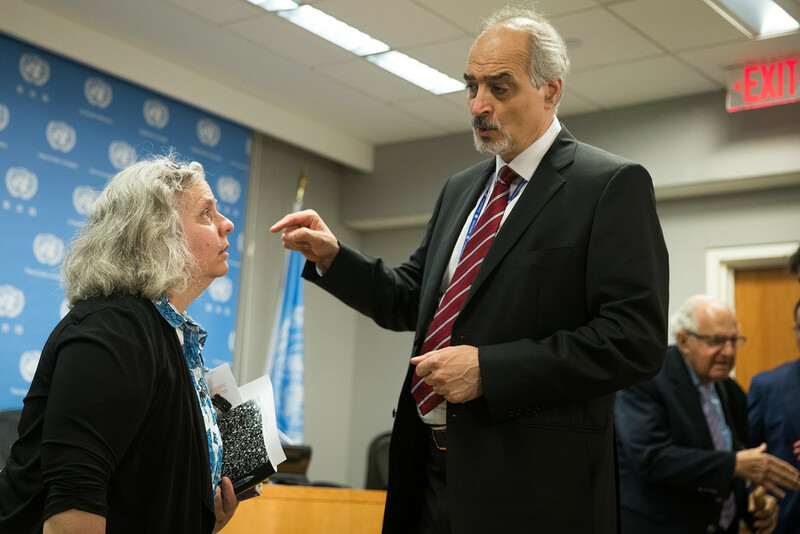 UNAC presents apologies for the war criminal regime as defense of Syria’s right to self determination; Assad may be a war criminal, but UNAC’s leaders tell us he is an “anti-imperialist” war criminal. All the better for US imperialism, the dirty deeds are done for free by a “sovereign” power. United States antiwar opposition cannot regain momentum without fully recognizing that Assad is first and foremost responsible for the humanitarian crisis in Syria. No other conclusion can be drawn from any serious assessment of the destruction and casualties attributable to the regime’s and Russia’s use of such weapons as barrel bombs, chemical gas, cruise missiles, napalm, phosphorus and cluster munitions, and vacuum bombs, against urban populations, and even against emergency, and medical personnel and hospitals. The tragic and inexcusable casualties resulting from the reprehensible US Coalition airstrikes in Syria, and the damage done to infrastructure by these attacks, simply cannot be compared to the half a million and counting Syrians who have perished, primarily due to the regime’s and Russia’s air strikes in densely populated urban areas. Relentless bombing is the primary reason why half of the country has been displaced, with many millions driven into refugee camps or into desperate and dangerous journeys to Europe. As for how to defeat Daesh without US Coalition airstrikes, it should be obvious upon reflection, that the only alternative to sectarian violence is a united, democratic Syria. Opposition to the bombing campaign, both by the regime against the people and by the US Coalition is how our antiwar movement can immediately take a stand in support of this alternative. UNAC, however, has chosen to lead the US antiwar movement behind the Assad regime, presenting the monstrous Assad as the most effective gendarme for crushing terrorists. This position is not only morally repugnant and clearly a betrayal of antiwar principles, it actually paves the way for the US “War on Terror”. It is essential the US antiwar movement take a principled stand against Assad and Putin’s relentless bombing campaign. It is essential that we stand with the oppressed in their struggle against a regime that rules through incarceration, torture and terror. Our antiwar movement must reach out to the Syrian people, and stand in solidarity with their struggle. This was Ms. Burke’s simple message, which sadly has fallen upon deaf ears and hard hearts.